NATURAL AUSTRALIA GOLD NUGGET SHAPED LIKE A MONKEY OR BABOON. This is a beautiful natural Australian gold nugget that is shaped like a monkey or baboon. 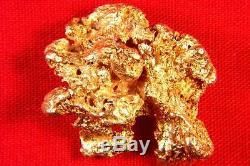 For more natural gold nuggets check out my gold store at: goldnuggetsales. It weighs 11.7 Grams and has a very distinct shape. In the first photo you can see a side view of what looks like a monkey, with his face on the right side, hunched over in a running position with the outline of an arm and feet. 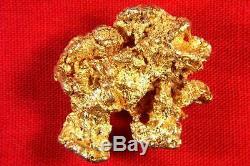 The size of this rare unique shaped gold nugget is just under 1" long x 7/8" wide x 5/16 thick. Collectors, investors and jewelers love the high purity and the beautiful color of Australian gold. Clean Australian gold nuggets like this one range from about 92% to 98% pure (22KT to 23KT). This beautiful gold specimen comes in a round plastic gem jar for display. It also comes with a certificate of authenticity. Add it to your collection today. Check out my gold store at goldnuggetsales. Gold is in more demand now and makes an excellent investment. I photograph all my nuggets using a close-up lens, which magnifies the nuggets to show more detail. The nugget you see is the nugget you will receive. The lines in the ruler are in 1/16 increments. Regarding weight please note that there are 15.43 grains in one gram and 31.1 grams in one troy ounce. The item "AUSTRALIAN NATURAL GOLD NUGGET SHAPED LIKE A MONKEY OR BABOON gold nuggets" is in sale since Tuesday, July 26, 2016. This item is in the category "Coins & Paper Money\Bullion\Gold\Nuggets". The seller is "goldseller2" and is located in Camas, Washington. This item can be shipped worldwide.